Home » Life in London » Food & Drink » What Do You Do when You’re Sick at Home? I know what I do – I cook! Well, I do it every other day too. But, when I am sick I try more adventurous recipes. By more adventurous, I don’t mean strange concoctions, just different to what I normally would cook. I also cook the usual dishes with a twist, which makes the whole experience of cooking and eating a bit more interesting. What about you? Do you do any other activity when you are having to be stuck at home? Now, why do I do it? I do that because it keeps me away from the computer for a while and it also keeps my mind off things. You know, the stress of everyday life and feeling miserable for being grounded and not being able to enjoy London outdoors. So, as I had to stay in last weekend, I made two recipes, which some of you may have already tried or tasted before. The first one is damson jam. 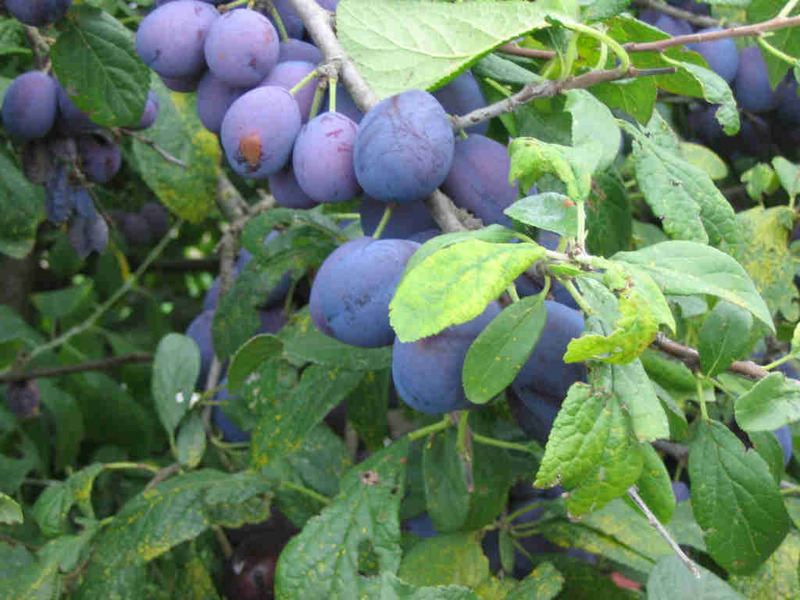 Damsons are the fruit of a subespecies of the plum tree. They definitely look like plums, only smaller and their flavour is so strong that they’re used for culinary purposes only. It looks like the picture on the right. The good thing about is that I did not have to add loads of sugar, which I hate. Its strong citrusy flavour is quite nice when spread thinly on toast. I had it for Sunday’s breakfast on rosemary bread toast. One caveat, though, is having to skim the stones! I counted and washed a handful of damsons, which I then put on a pot with just a bit of hot water straight from the kettle, enough to cover them and a bit more. I then put a bit of sugar on high heat for a few minutes. I then broke the damsons with a fork, and the stones started to come up to the surface. Then, it was just a matter of picking up the bones. The second recipe is an eggless carrot and nuts cake. I didn’t have any eggs, so I had to try and bake it like that. I did not even use any yogurt on the dough. Granted it is not the best looking cake ever, but it does taste good. What I realised is how difficult it is for vegan cakes to reach the same consistency and have the same appearance as the non-vegan cakes. I cooked some nuts in a pan with some water and oil and season-all powder (salt, pepper, crushed chillies, paprika, onion, etc) for a few minutes. I then poured the mix on a bowl with shredded carrot and some more hot water, just enough time for the water to cool and for the carrots to soften. Next, I added that mix to two cups of flour, baking powder and some salt. You need to add some more water if you see that the mix is too dry. Finally, I baked it at 180 C for about 45 minutes. There you go. What are you fave activities when having to stay indoors? I have to admit that cooking would be the last thing on my mind if I am sick. Yes, it’s not the first thing that crosses my mind, either! As I live on my own, I have learnt to do the kind of things that my mum would do for me when I’m sick. It can be very hard. Can’t remember the last time I was home sick but most definitely curl up in my duvet and watch movies. Cooking is the furthest thing from my mind. Crossed posts! Just commented on your blog. This is what I do when I finally can get up from bed and can manage. If I’m really sick (as opposed to just taking a duvet day) I try my best to put down my laptop and iPhone and just read a book or watch DVDs. It’s times like that when I realise I got sick in the first place because I don’t relax enough! If I am really, really sick, I do as little as possible too. It’s only those days when there’s nothing to eat in the fridge and no one around to go get it or cook something.